Surkotada: reconstructed image of the citadel and lower town. Distant View of the excavated remains from south. Surkotada: stone structure in mound. Rampart of Successive Periods (Outer). Surkotada is a small, 3.5 acre site northeast of Bhuj, in Gujarat. 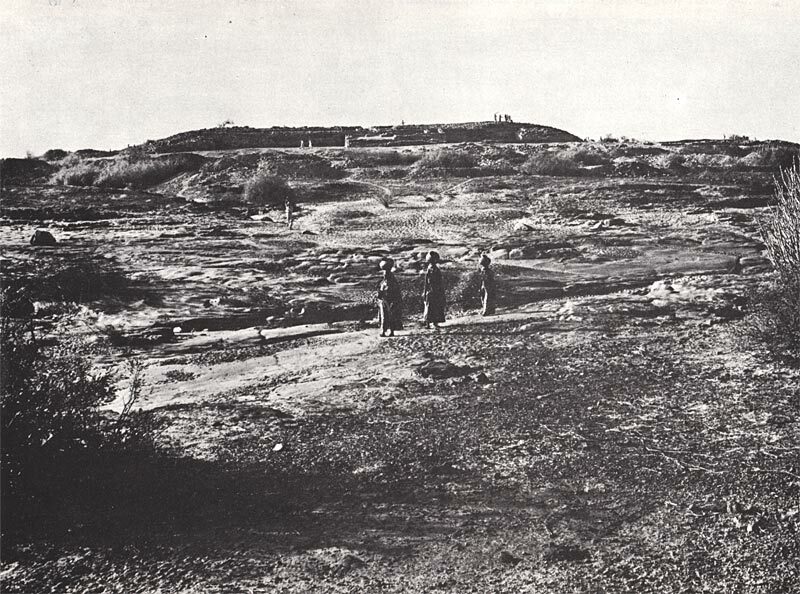 "The mound has an average height of five-to-eight metres (east-to-west) and was discovered by the author during the course of his explorations in Kutch in December, 1964," writes Jagat Pati Joshi in Excavation at Surkotada and Exploration in Kutch. 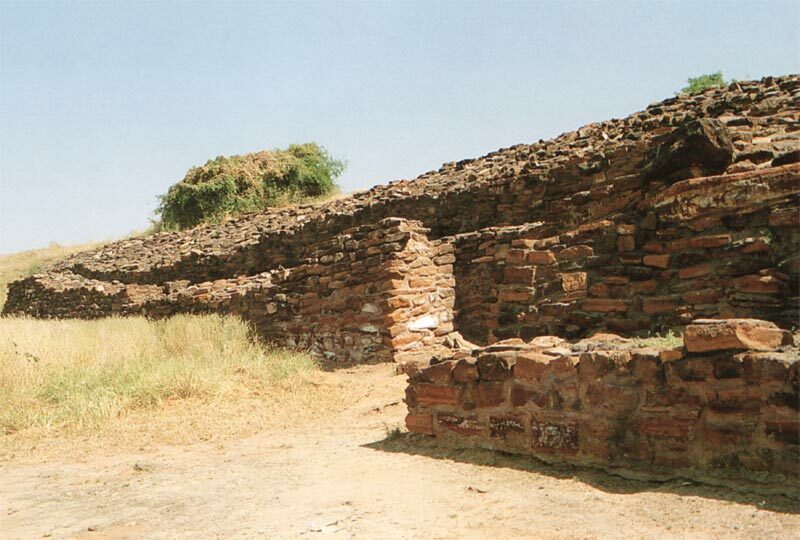 "At the time of its discovery, the mound at Surkotada appeared to be a potential site with not only its available rubble fortifications exposed at places on the surface itself but also having an adjacent lower area yielding Harappan and other pottery and antiquities. He continues: "The excavations at Surkotada have been significantly rewarding in unfolding a sequence of three cultural sub-periods well-within the span of Harappan chronology and this fact has been attested to by the C-14 dating, i.e. circa 2300 B.C. to 1700 B.C. . .. The Harappans had a fortified citadel and residential annexe in Period IA and the same pattern of settlement had been maintained through the successive sub-periods IB and IC." "Almost all the [Harappan] pottery shapes were in conformity with the material available at other Harappan sites." "The entrances in the southern and southeastern sides in the citadel and residential annexe respectively are just simply openings of moderate dimensions without any architectural embellishment." "At Surkotada, throughout, a compact citadel and residential annexe complex has been found, but no city complex has been unearthed." 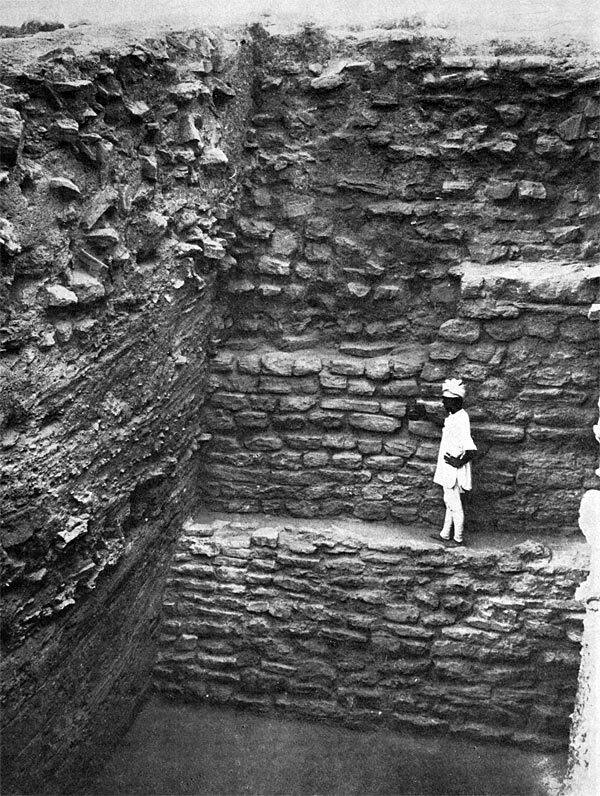 Jagat Pati Joshi, Excavation at Surkotada and Exploration in Kutch, Archaeological Survey of India, 1990, pp. 14-18. 1. 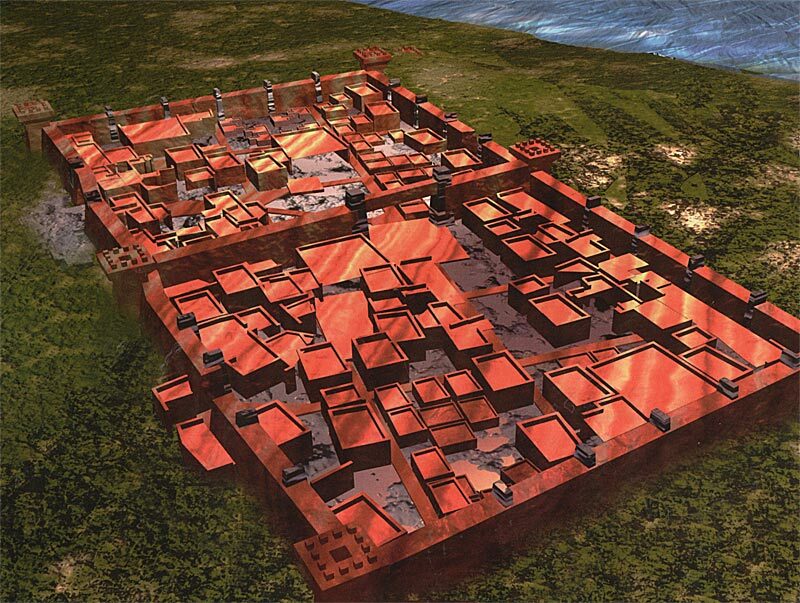 Surkotada: reconstructed image of the citadel and lower town. Computer illustration: Sushil Misal. Civilization in India: New Discoveries, Ed. Dilip K. Chakrabarti, p. 12. Computer Illustration by Sushil Mithal. 2. Distant View of the excavated remains from south. Joshi, Surkotada, Pl. VI. 3. Surkotada: stone structure in mound. Photograph DPA/Milind A. Ketkar. 4. Rampart of Successive Periods (Outer). Joshi, Surkotada, Pl. VIII.